National Register of Historic Places listings in Albany County, New York exclusive of the City of Albany: This is intended to be a complete list of properties and districts listed on the National Register of Historic Places in Albany County, New York, besides those in the City of Albany, itself (which are listed here). (#80002582) SR 11 and Alcove Rd. (#03001241) Bennett Hill Rd. at Rowe Rd. (#70000418) SW corner of Westerlo St. and Civill Ave.
Cohoes Intact 1890 Stick-Eastlake home with jerkined front roof built for textile mill manager. (#84002060) Roughly bounded by Oneida, Van Rensselaer, Columbia, Main, and Olmstead Sts. (#85002705) 140 Dunsbach Ferry Rd. (#03001518) Altamont Fairgrounds, vic. of Grand St.
(#71000525) 100 N. Mohawk St.
Cohoes Thousand-foot-long textile mill built in 1872 is preserved in excellent condition. The largest cotton mill in the United States when first built; was a major employer in the city when open. (#04000751) 1045 Clarksville South Rd. (#71000526) W of 252 N. Mohawk St., E of Reservoir St. near Manor Ave.
Cohoes High-quality stonework of this ca. 1840 lock on Erie Canal remains; only one of ten in city of Cohoes listed. (#79003247) Loudon Rd. from Crumite Rd. to Menands Rd. (#85002708) Roughly bounded by Menand Rd., Broadway, and Tillinghast Ave.
(#71000527) NW corner of Remsen and Oneida Sts. Cohoes 1874 brick building is most significant Second Empire building in Cohoes, with highly decorated facade unusual for the style. Still in use as theater after 1975 restoration, making it fourth-oldest music hall in use in the nation. (#01000580) Louden Rd. at Maxwell Rd. (#73001159) Olmstead St. between Ontario and Cayuga Sts. Cohoes Mill, portion of original Erie Canal and homes built for millworkers, all dating from mid-19th century. A microcosm of the city's economy of that era. 478 New Scotland Rd. S.
(#85002744) 207 Old Niskayuna Rd. (#85002745) 210 Old Loudon Rd. (#83001635) Old Albany, Pond Hill, Methodist Hill Rds. and Main St.
(#04000288) 4th Ave. and 24th St.
Coordinates missing Berne 1835 brick church marks transition between Federal and Greek Revival styles; hosted first state Anti-Rent convention ten years after construction. (#01001396) 283 Beaver Dam Rd. (#79001565) Mohawk and Seneca Sts. Cohoes 1896 Romanesque church demolished in 1998. (#12000007) New Scotland & Mullens Rds., Bridge St.
(#85002749) 71 Old Niskayuna Rd. (#85002750) 158 Spring Street Rd. Delmar 1940 building, is only one of 13 Louis Simon post offices in state without a cupola. WPA mural in lobby. (#01001434) NY 143 at Blossom Hill Rd. (#82001085) 3647 Settles Hill Rd. (#97000117) 207 Old Niskayuna Rd. Watervliet Oldest U.S. arsenal in continuous use. 73002247 (increase)) Watervliet Shaker Rd. (#05001394) 483 Travis Hill Rd. 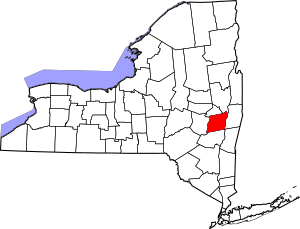 National Register of Historic Places listings in Albany County, New York Facts for Kids. Kiddle Encyclopedia.